Yesterday, provided the grand opening of ZerØday Brewing Company as the newest local brewery in Central PA. It was an opening with fanfare and well attended by the mayor and a Storm Trooper for the traditional ribbon cutting. Over the past year I have attended three different opening days for local breweries (Columbia Kettle Works, Moo-Duck Brewing, and ZerØday) and without a doubt this one was the best on multiple levels. I arrived well after the noon opening ceremonies but right into the thick of a very busy opening day. While the crowd was heavy, the husband and wife proprietors, Brandalynn and Theo Armstrong, made sure everything ran with exceptional smoothness. Upon arrival, I was able to quickly claim a corner spot near both the bar and the entrance. I was very promptly greeted by a friendly bartender and plied with my first beer; no wait. The service was impeccable. It was hard to tell this was their opening day as the service and atmosphere made for an exceptional time free of any issues. Theo Armstrong (the brewer) worked as bar back during my visit and made sure fresh clean glassware was always at the reach while his small but very busy team of bartenders served up his fine libations. He also clearly took the time to talk with patrons and to politely accept congratulations from many happy customers. Brandalynn worked the door greeting people warmly when she was not busily making sure everyone’s needs were met. In the lead up to this opening I watched the Armstrongs via the modern wonders of social media put together their dream and I was a little worried about the volume of orange paint they were splashing about in the prospective taproom. But the look of the place is fantastic. The taproom is very nicely appointed and while very orange, is in no way off putting. It has clean lines and is clearly well thought out all around. Just a beautiful place to brew and drink a pint. The beers were impressive even beyond first batch/smaller scale brewing standards. ZerØday opened with five offerings on tap: Firstborn (Dry Stout), Cheap Date (American Blonde), Wits End (Belgian Inspired Witbier), Zeroday IPA – Ep.1, Dolce Vita (Chocolate and Hazelnut Sweet Stout). My first beer was Dolce Vita. After hearing via twitter about the soft opening this was the beer I knew I had to try. It did not disappoint. Served on nitro it has a silky smooth mouthfeel with a creamy luscious head built to last. The aroma is like Nutella only somehow more inviting. Then as it warms up the finish becomes longer lasting and deeper with a proper hazelnut and creamy chocolate that just makes this beer. Very sweet, it would pair wonderfully with strawberries after a fine dinner. If there is any room for improvement here… it’s that the beer was served way too cold. Dolce Vita shows off its flavors as it warms up. This beer was exceptional and is worthy of a visit. Dolce Vita gets the Bearcat Seal of Approval. As for the other offerings: Cheap Date goes down easy like she should and will be great for hot days when you are looking for a session beer. Wits End was nicely constructed with a proper Belgian yeast and bitterness but lacked a peppery bite that I like in Witbier. 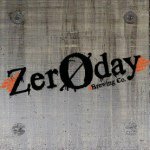 Zeroday IPA was clearly advertised as the first iteration. It was good but at 7.4% ABV, I was expecting more flavor and aroma from the hops and more body; just a tad thin. Firstborn was my least favorite of the offering but was still an exceptional stout. When I say it was my least favorite its almost unfair because it was rock solid. ZerØday’s beers were all good… and were frankly great when you consider this is the first time operating on the brand new brewing system. I can’t emphasize that enough. This would be excellent work for even a well-established small town brewery. The ceiling here is really high for future batches and I am sure they will not disappoint.